"Pictavian Serigala" : An alcoholic and brotherly alliance between the bastards from Pictavia and the werewolves from Malaysia for a record with a special concept. MANZER performs 80's Black Metal, with doses of Heavy Metal. 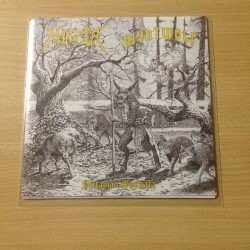 NIGHTWOLF delivers primitive and headbanging Black/Speed Metal. The whole record will let you smell a strong Rock'n'Roll and Punk stench as well! Each band offers an unreleased track and a cover song. This is also a tribute to the mighty Japanese Metal scene, as MANZER covers SABBAT ("Darkness and Evil"), and NIGHTWOLF covers SACRIFICE ("Friday Nightmare"). 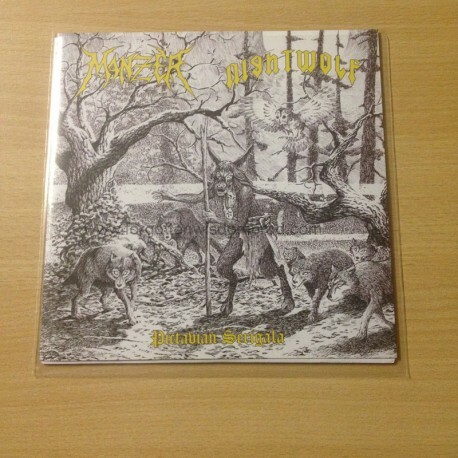 United against modern trends, posers and other hipsters, the two bands are ready to release the wolves on you! Artwork by Renaud B. Limited to 300 copies.